He is currently involved in three large projects: WISDoM, Silver and XIA. He has published over 50 papers in leading conferences including SIGCOMM and NSDI, and has served as the program chair for IMC, HotNets and HotSDN. 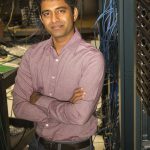 Akella is a recipient of the SIGCOMM Rising Star Award (2014), the NSF Future Internet Architecture Grant (2010), the NetApp Faculty Fellowship (2010), an NSF CAREER award (2008) and the IBM Ph.D. Fellowship (2003-2005). His research group has won several awards, including best paper awards at CoNext’13, SOCC’13 and IMC’10, the 2012 ACM SIGCOMM Dissertation Award Runner-up, the UW-Madison CS Outstanding Graduate Student Research Award and prestigious Ph.D. fellowships from Google and IBM.